Prototype: German State Railroad Company (DRG) class 58.10-21 (former Prussian G 12) freight steam locomotive. With Reichsbahn lanterns and type 3T 20 tender. Road number 58 1880. The locomotive looks as it did around 1936. Model: The locomotive has a digital decoder and extensive sound functions. It also has controlled high-efficiency propulsion with a flywheel, mounted in the boiler. 5 axles powered. Traction tires. The locomotive and tender are constructed mostly of metal. A smoke unit contact is included. A 7226 smoke generator kit can be installed in the locomotive. The dual headlights change over with the direction of travel, will work in conventional operation, and can be controlled digitally. Maintenance-free warm white LEDs are used for the lighting. There is a permanent close coupling with a guide mechanism between the locomotive and tender. There is a close coupler with an NEM coupler pocket and guide mechanism on the front of the locomotive. There is an NEM coupler pocket and guide mechanism with a Telex coupler on the rear of the tender. The locomotive has many separately applied details such as piping and sand pipes. The locomotive has cab lighting. Piston rod protection sleeves and brake hoses are included. Length over the buffers 21.2 cm / 8-3/8". Highlights: Especially finely detailed metal construction. Partially open bar frame. Digital decoder and extensive sound functions included. Maintenance-free warm white LEDs for lighting. A smoke generator can be installed. 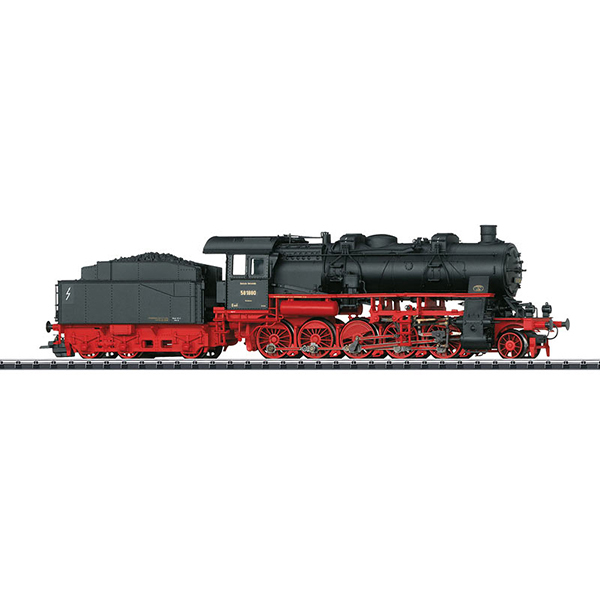 This model can be found in an AC version in the Märklin H0 assortment under item number 37587. Digital decoder with up to 9 digitally controlled functions when operated with the 60652/60653 Mobile Station. Up to 5 functions when operated with the 6021 Control Unit. Up to 16 functions when operated with the 60212/60213/60214/60215 Central Station. The functions depend on how the locomotive is equipped.